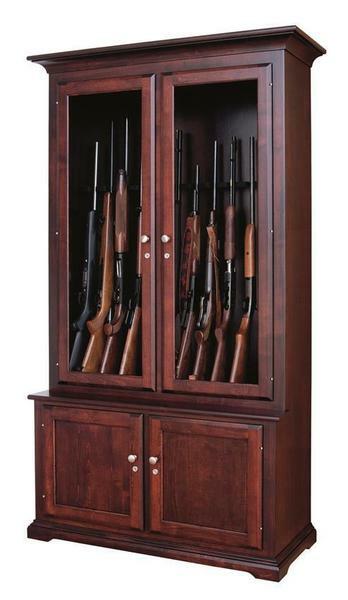 Store your treasured firearms inside an equally treasured and beautiful gun cabinet. Steel gun safes are a very secure way to store your shot guns, rifles and hand guns. However, they are hidden away and not appreciated as much as they would be inside this heirloom quality solid wood gun cabinet. It's important to have a safe and secure place to store your guns and firearms, which is why all of our gun cabinets come standard with secure locks and your choice of the standard double strength glass or tempered glass to keep you and your family safe and to give you peace of mind, knowing that no one else will have access to your firearms without your permission. This large solid wood Gun Cabinet has the capacity to store and display up to 12 of your rifles or shotguns with a width of 44 inches and a height 76 inches. It is shown in a beautiful brown maple wood with our OCS 227 rich cherry stain but is also available in oak wood and cherry wood. This American made gun cabinet is built from top-quality hardwoods that are hand selected by our talented Amish craftsmen. Each gun cabinet is handcrafted to order for our customers so we can provide a completely custom piece of Amish craftsmanship that our customers will be proud to own. Call to receive wood and finish samples to help match your custom gun cabinet to additional furniture in your home or business. In order to protect your firearms, the hardwood gun rack that is built into this piece is felt lined with standard black felt to prevent any scratching or damage to your guns. The bottom cabinet area provides plenty of additional storage for your gun cleaning supplies, ammunition, or hand guns. These doors also come standard with secure locks to keep your items locked away for safe keeping. Our gun cabinets are handcrafted for each customer by Old Order Amish craftsmen from their wood shops right here in the United States. They can be completely customized to your specifications and gun storage needs. Send in your custom request and we will work up a custom furniture quote for you. We also make an Amish 8-Gun Cabinet if you are looking for a smaller size and gun capacity. This solid wood Traditional 12-Gun Cabinet is a top seller. When you see the quality craftsmanship and attention to detail put into this beautiful gun cabinet, it will make you proud to own an American made piece of Amish craftsmanship. The Traditional Contemporary style of this gun cabinet can also be built in a Mission style or Heirloom style to match your home decor or style preferences.